, an eminent Greek historian, was of Megalopolis, a city of Arcadia, and was the son of Lycortas, general of the Achaeans, who were then the most powerful republic in Greece. He was born in the fourth year of the 143d olympiad, or in the 548th year of the building of Rome, or about 203 years before Christ. When twentyfour years of age, the Achaeans sent him and his father Lycortas ambassadors to the king of Egypt; and the son had afterwards the same honour, when he was deputed to go to the Roman consul, who made war upon Perses, king of Macedon. In the consulships of Æmilius Paetus and Julius Pennus, a thousand Achaeans were ordered to Rome, as hostages, for the good behaviour of their countrymen who were suspected of designs against the Romans; and were there detained seventeen years. 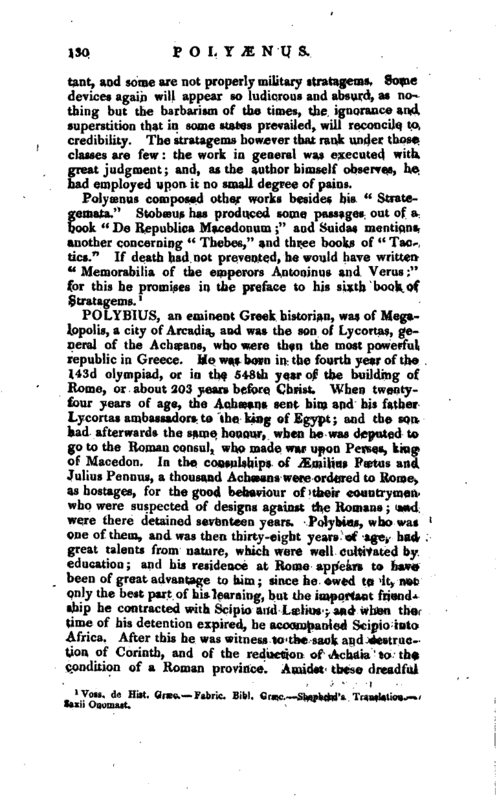 Polybius, who was one of them, and was then thirty-eight years of age, had great talents from nature, which were well cultivated by education; and his residence at Rome appears to have been of great advantage to him since he owed to it, not only the best part of his learning, but the important friendship he contracted with Scipio and Lselius and when the time of his detention expired, he accompanied Scipio into Africa. After this he was witness to the sack and destruc* tion of Corinth, and of the reduction of Achaia to tho condition of a Roman provinces Amidst these dreadful | scenes, he displayed noble traits of patriotism and disinterestedness, which obtained for him so much credit, that he was entrusted with the care of settling the new form of government in the cities of Greece, which office he performed to the satisfaction both of the Romans and the Greeks. In all his journeys he amassed materials for his history, and took such observations as to render his descriptions very accurate. 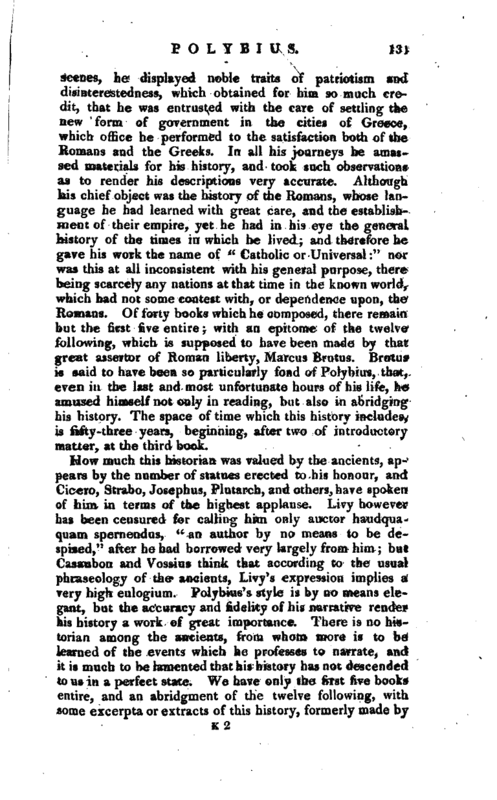 Although his chief object was the history of the Romans, whose language he had learned with great care, and the establishment of their empire, yet he had in his eye the general history of the times in which he lived and therefore he gave his work the name of “Catholic or Universal” nor was this at all inconsistent with his general purpose, there being scarcely any nations at that time in the known world, which had not some contest with, or dependence upon, the Romans. Of forty books which he composed, there remain but the first five entire; with an epitome of the twelve following, which is supposed to have been made by that great assertor of Roman liberty, Marcus Brutus. Brutus is said to have been so particularly fond of Polybius, that, even in the last and most unfortunate hours of his life, he amused himself not only in reading, but also in abridging his history. The space of time which this history includes, is fifty-three years, beginning, after two of introductory matter, at the third book. How much this historian was valued by the ancients, appears by the number of statues erected to his honour, and Cicero, Strabo, Josephus, Plutarch, and others, have spoken, of him in terms of the highest applause. Livy however has been censured for calling him only auctor haudquaquam spernendus, “an author by no means to be despised,” after he had borrowed very largely from him but Casaubon and Vossius think that according to the usual phraseology of the ancients, Livy’s expression implies a rery high eulogium. Polybius’s style is by no means elegant, but the accuracy and fidelity of his narrative render his history a work of great importance. There is no historian among the ancients, from whom more is to be learned of the events which he professes to narrate, and it is much to be lamented that his history has not descended to us in a perfect state. 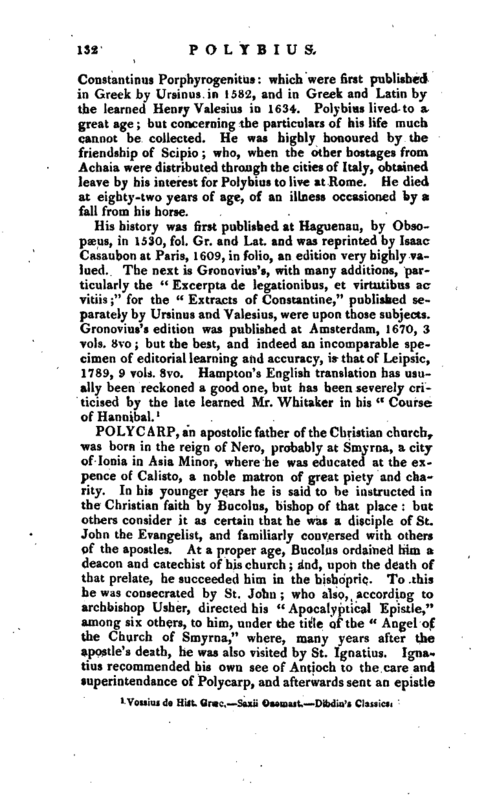 We have only the Brst five books entire, and an abridgment of the twelve following, with some excerpta or extracts of this history, formerly made by | Constantinus Forphyrogenitus which were first published in Greek by Ursinus in 1582, and in Greek and Latin by the learned Henry Valesius in 1634. Poly bi us lived to a great age; but concerning the particulars of his life much eannot be collected. He was highly honoured by the friendship of Scipio who, when the other hostages from Achaia were distributed through the cities of Italy, obtained leave by his interest for Polybius to live at Rome. He died at eighty-two years of age, of an illness occasioned by a fall from his horse. 1 Vossius de Hist, Graec. Saxii Onemast. Dibdiu’s Classics.